One person leaves the group. The remaining group secretly decides on a common object [ie toothbrush, shoe, car, etc.] – something everyone has. Let’s go with toothbrush. The outside person comes back to the group and can ask anyone, “What’s yours like?” “Green.” “Wet.” “Minty.” “Blue.” “New.” The outside person has to guess what object the group is referring to … get it? Let’s say our object is the Bible. I sat with three women on Sunday morning after worship. Each had their Bibles with them, as we had planned on meeting for Bible study. They had the Bibles they were given in confirmation. One was presented in the mid-60s; the other in the mid-30s. 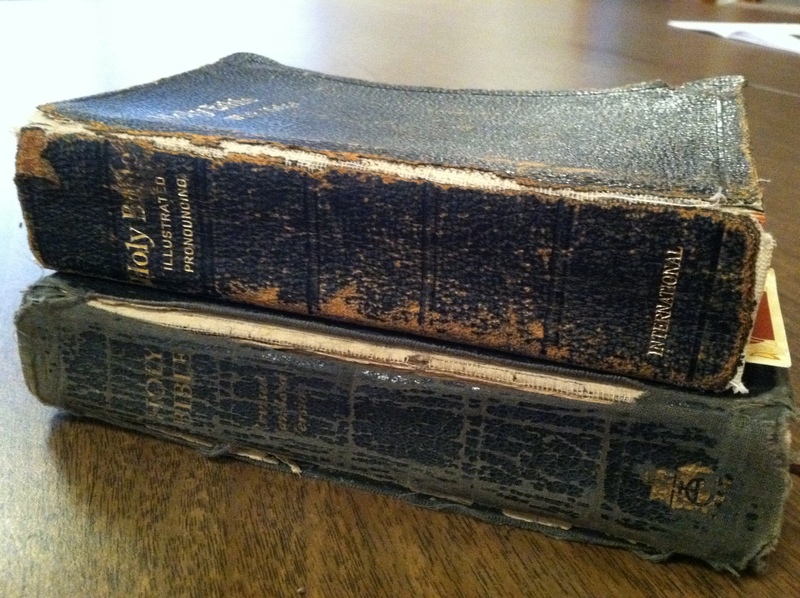 The Bibles were worn, used, written in, with pages loose in the spine. Is it a family Bible? Is it on the shelf or on your bedside table? Is it new, hardcover or paperback? Full of highlighting or bookmarks? Is it a place you go in time of trouble and in times of joy? What story does your Bible tell? Yesterday was Palm Sunday – the beginning of Holy Week. After worshipping together with palms waving, children singing, and eating bread together, we assembled personal health kits. It’s been our Lenten mission project coinciding with Lutheran World Relief’s Baskets of Promise campaign. We’ve collected bars of soap, combs, toothbrushes, nail clippers, and towels for the last month and a half. Yesterday was the day we put it all together! We assembled 32 kits together! Thirty-two people who are in need will have a toothbrush and towel thanks to your effort. A huge thank you to everyone who donated to the project and to all who helped assemble them into packages of hope for our neighbors around the world! Say what you will about winter – whether you’re enjoying every snow fall or eagerly waiting for spring – but it sure can be beautiful. These photos were snapped last Thursday – an absolutely beautiful morning at Red Oak Grove. Click on the first photo to scroll through the winter wonderland. Thanks to Judy W. for many of these awesome photographs! Hey. What’s up with the ashes? Join us at Red Oak Grove tonight for a service of ashes and Holy Communion at 7pm. All are welcome! Red Oak Grove has a brand new Facebook page – a virtual place to gather in grace, just as our mission statement proclaims. To be a part of this virtual community of people who know and love ROG, log onto your Facebook account, search for “roglutheran” in the search bar at the top of the page, and then click LIKE. That should lead you straight to us! Not on Facebook? Click this link and you’ll still be able to see what we’re talking about. You won’t be able to add to the conversation but you can see what’s going on all the same. This past Sunday was Baptism of our Lord Sunday – the Sunday in the church year when we celebrate and recognize Jesus’ baptism by the Holy Spirit. Check out the third chapter of Luke for the full story. In church, we took to remembering our own baptisms. We sprinkled each other with water using evergreen branches – reminding us that every time we get wet, we should remember our baptisms. 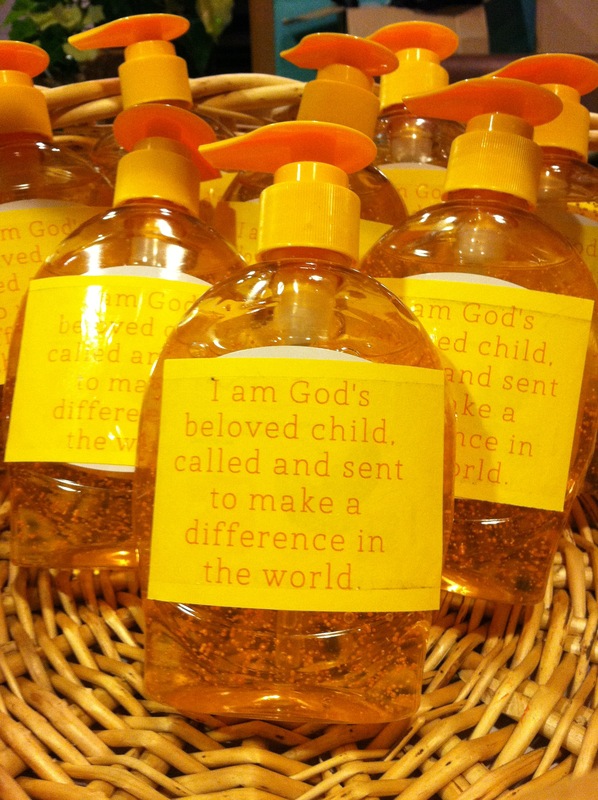 Families also received bottles of soap [just what the kids coming up for the children’s sermon wanted!] with an important phrase taped to the bottle. The instructions were that every time we wash our hands, we should say those words to ourselves. What would happen if that was the message we heard every single day? That we are loved. That we are called by God. That we are sent into the world to make a difference. If we hear it enough, we just might start to believe it and, oh, what a difference that will make in our own lives and the lives of people around us. This day and everyday – you are a beloved child of God, called and sent into the world to make a difference. Hear it. Believe it. Live into it. The way we tell stories has changed in this age of Twitter, Facebook, and email. Imagine if Mary and Joseph had Twitter. Or email. Or Facebook. How would the Christmas story be told them? Check out this great video of how social media tells the story. It’s the season of Advent. The season of waiting … and waiting … and waiting for that blessed Christmas morning. Advent means our sanctuary is filled with blue [blue is the color of Advent] and many of us may use an Advent calendar to wait … and wait … and wait until Christmas. At Red Oak Grove, we’re waiting for Christmas in some new ways this year. We worship every Wednesday in Advent with a beautiful service called Holden Evening Prayer. [Coffee and treats at 6:30. Worship at 7. You should come!] It’s a service of singing that includes Mary’s song from scripture. My soul magnifies the Lord, and my spirit rejoices in God my Savior, for he has looked with favor on the lowliness of his servant. Surely, from now on all generations will call me blessed; for the Mighty One has done great things for me, and holy is his name. For this season, we also held an ADVENTure following Sunday School a couple weeks ago. We made Advent calendars, painted ornaments, made Christmas cards for members of ROG, and rolled lefse. It was a great start to a season that asks us to prepare for Christmas – to prepare for the birth of Jesus. And now this Sunday – the 16th – we will prepare for the birth of Jesus by hearing the story told once more, this time through the songs and costumes and voices of our Sunday School youth. It’s Christmas program time! Join us at 9am on Sunday to hear the gospel message proclaimed through sheep and donkeys and bugs and birds! For the last month, we’ve been collecting shoeboxes and all sort of things to stuff in the shoeboxes at Red Oak Grove. Pencils and markers and stuffed animals and toothbrushes and all sorts of stuff filled our collection baskets and this past Sunday, we completed the service project for Operation Christmas Child. 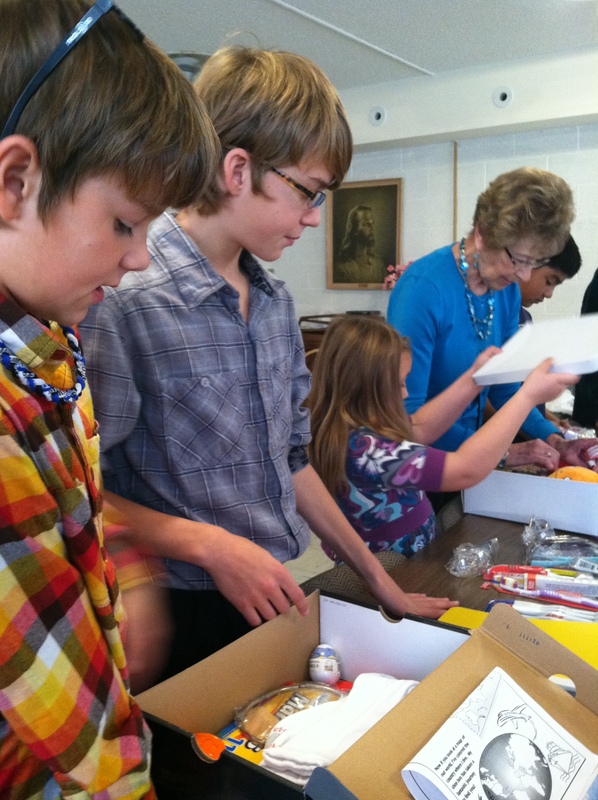 Together we packed THIRTY shoeboxes on Sunday! How great is that! 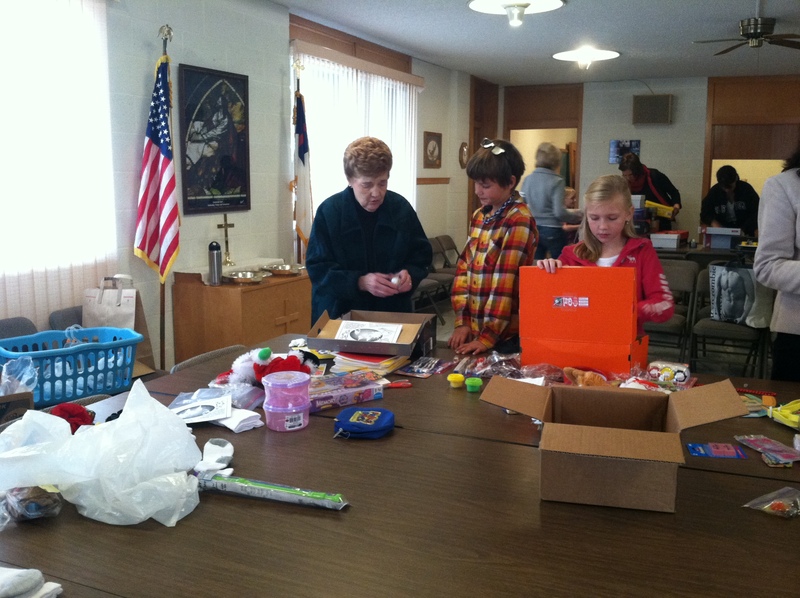 It was a intergenerational service project in the Fellowship Room. We’ll load them up to the drop-off next week and they’ll be off to children around the world who need them. The corn in the field behind the church has been harvested and the leaves outside the church doors are turning all sort of colors. Autumn has arrived. 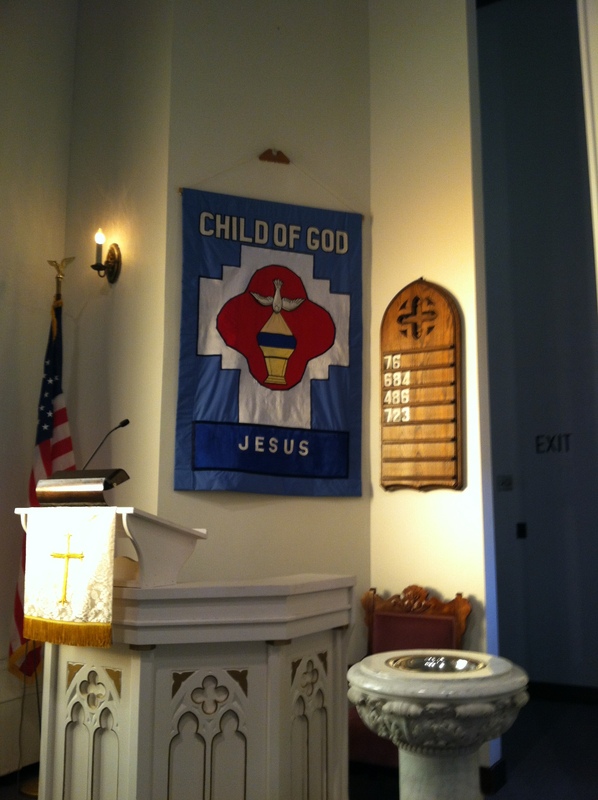 With the season of autumn comes a new year at the church. We’ve kicked off the Sunday School year and confirmation is in full swing. [Have a youth involved? Schedules for both groups have been posted here.] It’s been a complete joy to have kids running around the church in the past weeks. There is always room for more so here is another invitation. All kids are welcome on Sunday mornings and so are adults! We are doing Sunday School in a large group format this year and the more parents, grandparents, and adults the better! We are always searching out adults with gifts to share [that’s you! we all have gifts to share!] and always looking for storytellers, music leaders, art helpers, mentors, and friends. Some Sunday morning, follow the laughter and the singing and join us in the education hallway. It will be fun. ps. check out the photos tab. New photos have been posted!